I Forgot to Clock In... Now What? Your alarm doesn't go off, your coffee maker stops working, and you have no idea where you left your keys. We've all experienced this type of morning in some form. Yet despite everything, you somehow manage to push through. You scramble into your car, maneuver through the morning traffic, and by sheer grit, manage to make it to work without a second to spare. You let out a sigh of relief, and start your day. First of all, don't panic! Take a deep breath and try not to stress. You're still going to be paid. While it's important to punch in/out consistently and on a regular basis, accidents are bound to happen, and in this particular scenario, the law sides with the employee. According to the Fair Labor Standards Act (FLSA), employers must pay exempt (or hourly) employees for all time worked, regardless of using a time clock system. Furthermore, it's illegal for employers to reduce/dock pay as a discipline for employees clocking in late or forgetting to punch out. As long as the worker started on time, they must be compensated for the hours they worked. To illustrate this idea, let's suppose an employee begins working at 9 a.m. but doesn't remember to clock in until 12 p.m. Even though the worker clocked in late, the employer must pay the hourly wage starting at 9 a.m. Whether the employee punches in or not, it's ultimately the employer's responsibility to oversee and manage the actual hours worked. In order to avoid any pay discrepancies, especially for payroll, it's crucial that you notify your manager about clocking in late as soon as possible. Try talking to your manager in person, rather than through a note or an email, so that you can tell them exactly what happened and specifically what time you actually started working. Be open and honest about the situation. If necessary, provide your manager with any evidence that verifies when you started work, such as completed reports and/or witnesses. It's helpful if you have a shift supervisor who oversees workplace attendance, since they can account for your tardiness. But if this is your first offense, chances are your manager won't make a big deal out of it. If your company uses an online time and attendance system, like Webtimeclock or any other service, editing timecards is a very simple procedure and an easy fix. But if this starts to become a regular problem, in which employees are failing to clock in/out regularly, employers have the right to take disciplinary action. Somewhere within the company's employee handbook should be the policies and procedures regarding employee's time clock use. This handbook will outline where, when, and how workers should punch in/out. However more importantly, it will include any disciplinary procedures for when employees fail to accurately and consistently track their time. While the FLSA clearly states that employers must pay for hours worked, including missed punches, there are a few steps that companies may take as a way to prevent long-term attendance issues. For example, the first infraction may require a verbal warning. Nothing too menacing, just a friendly reminder that clocking in/out on time is important. Afterwards, the next infraction may result in a written warning. This reminder is more in depth, and tries to explain that proper time tracking is critical to the production and efficiency of the company. And finally after several warnings, another infraction may result in suspension and/or termination. Therefore, if you've missed punching in/out a few times recently, I suggest you look over your employee handbook. It will inform you about your specific company's policies, and may help encourage you to be more attentive in the future. If you find that remembering to clock in/out has become problematic for you, there are few simple changes you can make to help. One idea is to get to work earlier. Rather than rushing into the office at the last second, and consequently forgetting to clock in, try arriving to work several minutes before your shift starts. In the mornings, set your alarm for a few minutes earlier, prepare anything you need the night before, and leave on time for your morning commute. Find a manageable routine, and make it happen. A few minutes can really make a difference. Another idea is to use notifications. Considering that it's 2018, and that 77% of Americans own a smartphone (95% own a cell phone of some kind), notifications are a logical answer for reminding you to clock in on time. It's an easy way to remember without having to consciously think about it. Simply set the time you need the reminder to come in, and you won't forget. Plus, if your company allows punching in through your phone, you're already halfway there. 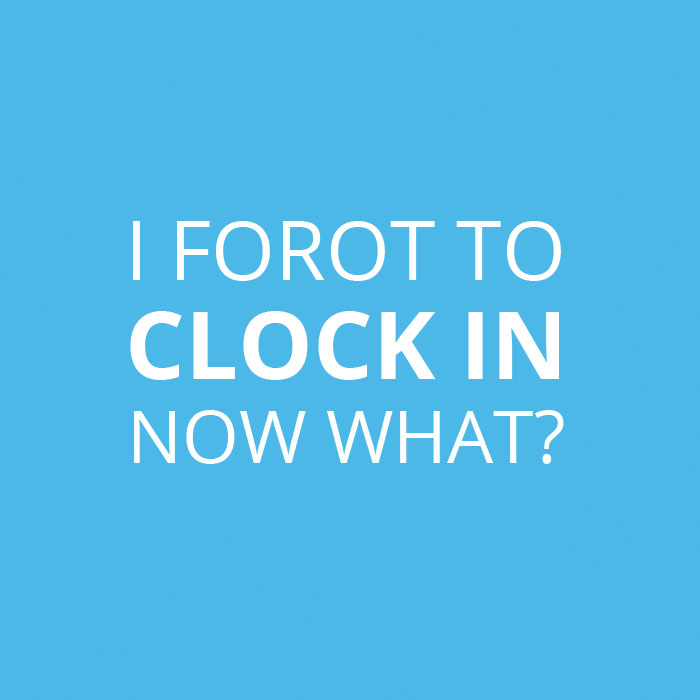 As a result, forgetting to clock in is never fun. It's a stressful moment realizing that you've made a mistake. But thanks to the FLSA, you will still be paid regardless of punching in or out. Just remember to communicate with your manager so that they can edit your timecard for payroll purposes. When you have a chance, review the employee handbook for disciplinary actions for subsequent infractions. And to make your life easier, try arriving to work earlier and set reminders to punch in on time. Time tracking is a necessary part of business, and while mistakes sometimes happen, these 4 tips will help make the process of forgetting to clock in as stress free as possible.